Now that you know how my Mr. and I met and fell in love in a coffee shop, I’d like to share about our engagement! This is one of my favorite stories to tell, so any excuse to share it, I’ll take it!! First off, we knew weeks after meeting each other that we were it for each other-that we were going to marry each other. Second (this may blow your mind! ), we found our wedding venue and booked our wedding day before we were “officially” engaged. Like 9 months before we were engaged. I know, either we were crazy or we were certain. Certain is definitely what we were. Anyway, months after dating, Matt had been asked by multiple people when we were going to get engaged. He ACCIDENTALLY let some information slip directly to me, and I found out he was planning on proposing by March of 2015. I waited so (im)patiently for months! I occasionally asked if he had a plan yet, and he would instantly shut me down and tell me not to worry about it. Fast forward to January 2015, which is when we booked our wedding venue for October 2015… I asked and asked and asked about when we were going to get engaged, and got no answer. FINALLY, Matt told me he was looking at rings. Then, he told me he found one! Imagine the excitement brewing inside of me, knowing that the time was finally coming. Not. He ordered the ring online, and when it arrived he was extremely disappointed. So, he was back at square one. At this point, Matt decided I knew way too much already, and told me he had made the decision to not only no longer give me any information, but lie to me any time I asked questions. March is almost over and I’m getting so dang impatient!! Spring break was coming up and we had decided to take a road trip up to Northern California, so I was hoping and praying that the question would finally be popped on our trip! My hopes and dreams were crushed when my dear boyfriend decided to tell me he had no ring and no money for a ring. Now, this was not what caused the disappointment. I was begging Matt for months to just propose without a ring because I just want to be engaged. He, ever so sweetly, said “absolutely not!”. Ugh. So, I knew we were ‘absolutely’ not getting engaged until that man had a ring. Sunday before our road trip, we were at church and Matt was behaving with such secrecy. He filled out a prayer card and refused to let me see it, then dropped it in the prayer box. I asked all day what was on the card because I was concerned, but he would not budge! I finally got upset because I couldn’t understand why the heck he couldn’t trust me with whatever information was on the dang card! He finally broke and explained that he was asking for prayer over getting the money for a ring and wisdom regarding when was the right time to get engaged. Okay… so, we it wasn’t happening any time soon. Days later, we ventured off on our road trip, so excited to take a trip together. We had planned to stay with my brother in Sacramento, so that was our destination for the end of our first day. We stopped in so many awesome places along the way, and my poor brother ended up staying up until 3am waiting for us to arrive. Oops! We spent the next day in Yosemite. I had never been there, but Matt had fond memories of this beautiful beautiful place. We were ready to hike, and ready to spend the day basking in some God’s glorious creation. On the way up, Matt got so excited when he saw what looked like an awesome trail to some waterfalls. We got out of the car, and trekked, with a camera bag on each of our backs, up some slippery rocks to a beautiful waterfall. It started out pretty rocky (pun intended), though..
Matt wanted to climb up a really slippery boulder, and his leg slipped on his way up..causing his brand new tripod to break, and his leg to get a little banged up. I tried to talk him into going a different way, but he insisted on going THIS way. I didn’t want to climb the boulder because my tripod was longer than his and was not going to make the climb. Matt kept climbing and I was left standing alone. Not so romantic by yourself… I decided to go a separate way, frustrated with my boyfriend for leaving me. We eventually made it up to the same spot, and decided to stop for some pictures. Matt set my camera up quite a ways from us, but kept saying he couldn’t figure out how to use it, so he came closer to me and set his own camera up. There we stood, in front of a gorgeous, roaring waterfall, all frustration gone. We faced the camera and flashed some smiles, then I recommended turning to face the waterfall for some pictures. Matt, for whatever reason (wink, wink) was flustered, but turned with me. He kept pressing the camera remote, and the camera kept taking photos of us. Then!!!!!!!! 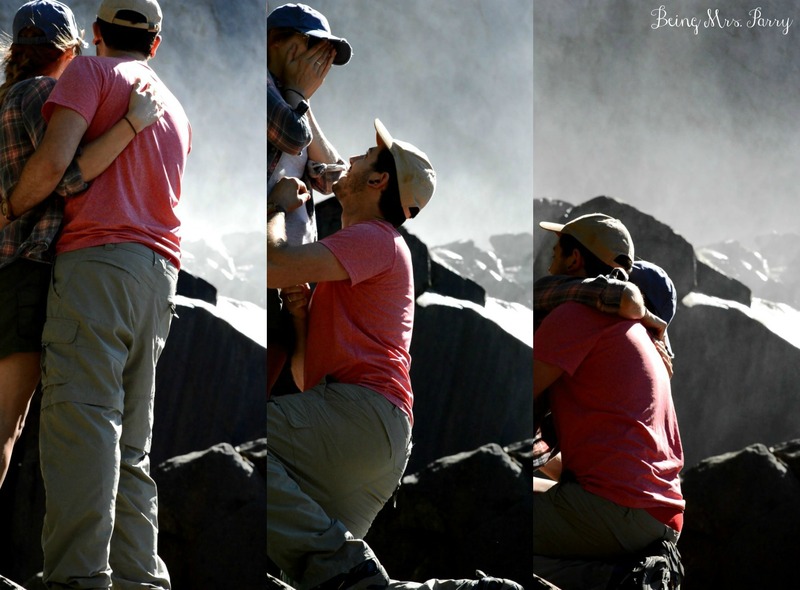 Matt: Will you marry me? Oh. My. Goodness. Of course, I said YES!! I also said, “I’m such a brat!” about a million times because I felt like such a spoiled brat! I was getting so frustrated for months, when this man-the man I knew I was going to marry no matter what, had it all figured out! Matt proceeded to tell me that my camera was recording everything, and that he got pictures of everything on his own camera. That was one request I made early on, was that we have pictures of our engagement to hold on to forever. He planned everything out so well, and I was blown away! In case you’d like to watch the video, here you go! Thank you for reading! I hope you enjoyed our engagement story, and I hope to hear some of yours! If you would like to share the story of your engagement, and have the opportunity to have it featured on Being Mrs. Parry, please share below!